Relocating your seats for the 2018 season is a simple process. As you select new locations, you will be able to view the new seats in your shopping cart. When you have reviewed your new locations, click "Submit Selection". You can observe the seat selection process prior to your scheduled appointment time but will not be able to select seats for your account until your selection date and time. Change/select your seats for the 2018 season by logging in on or after the day and time you were allocated. 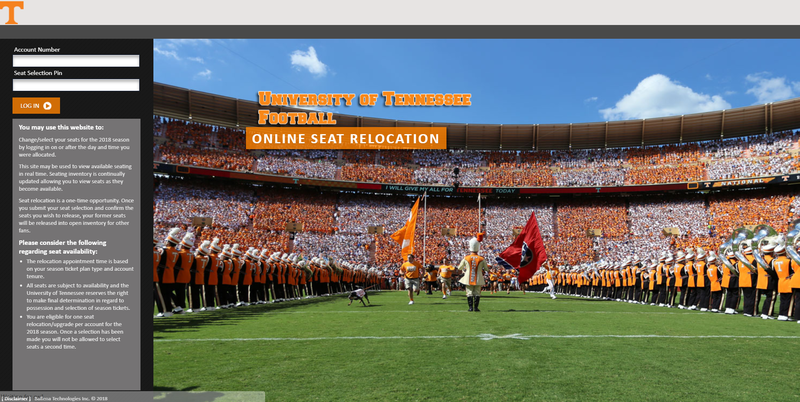 All seats are subject to availability and the University of Tennessee reserves the right to make final determination in regard to possession and selection of season tickets. You are eligible for one seat relocation/upgrade per account for the 2018 season. Once a selection has been made you will not be allowed to select seats a second time. To remove any of your new selections, please uncheck the box(es) adjacent to the individual seat(s) that you wish to release. When you confirm your selections, the seats below will be added to your account.